Moving forward to the 21st century, it is the members of the Church of England who fund it themselves. Although the Church of England can be described as the national church, it receives no funding from the state, unlike religious bodies in other countries such as Belgium and Germany, which receive funding through the tax system. Each parish provides the money needed to support the church and the clergy. Since parishes have different abilities to find the money needed, either because of the size of the congregation or their level of income, a mechanism, known as ‘Parish Share’ is used to enable those parishes with more money to support those parishes who are not so well off. The Parish Share is administered by the diocese. Individual parishes also contribute, through the Parish Share, to the administration of the church and charitable activities at the diocesan level. 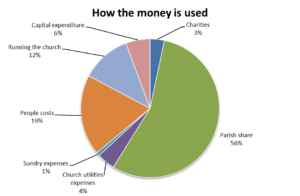 The following charts show where the money comes from in our parish. In 2016, our income was £130,000. Most of it is given as planned giving; this includes money returned by the government through Gift Aid. 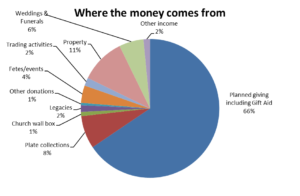 This chart shows where the money collected goes. In 2016, we spent £123,000. The largest part (‘parish share’) pays mainly for our own ministry costs and also supports poorer parishes. Some money goes to the charities we support as a parish. To find out more about them, go to this page. 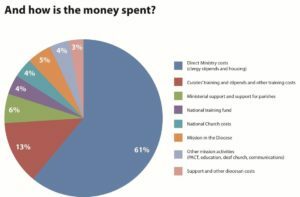 What the diocese does with our moneyThe following chart shows how the diocese spends and distributes the money it receives. In 2016, the budget for the diocese was £23,719,000. How should we respond – Ways of givingRegular giving is the best way to give. You can either set up a Standing Order to give money directly from your bank account or you can use the Charities Aid Foundation (CAF) to give money to the church’s CAF account. For Standing Orders, you can download, complete and send this form standing_order_mandate. If you qualify for Gift Aid, complete the relevant section on the form. For giving via CAF, go to this page.One off gifts can be made by sending a cheque to the Parish Office or online to our CAF account. “Each of you should use whatever gift you have received to serve others, as faithful stewards of God’s grace in its various forms.” 1 Peter 4:10We can review how much money we give, how we give it, what we should give to as a church. It is not only money we can give. We can use whatever skills and time we have to support the church work. In 2016, we gave £100,000. How much more could we do, if we gave more. The average amount given for each church member each week is just under £8. With an increase of 25%, an average of £10 would enable us to be more effective in our community. To all who give generously, grateful thanks are due.